Miracle in Be’er Sheva: Bus passengers escaped serious injuries when a Hamas missile struck. Iron Dome intercepted 8 other rockets. A Hamas terrorist missile hit next to a bus in Be’er Sheva shortly after 8 a.m. Tuesday, but passengers escaped serious injuries except for shock. The bus driver person suffered light shrapnel wounds and was rushed to Soroka Medical center. He was cited as hero by following instructions and urging passengers to get off the bus when he heard the early warning siren. Thirty seconds later, the missile hit next to the bus, leaving it a heap of shredded metal and broken glass. Another rocket hit a building, causing extensive damage, and one parked vehicle also was damaged. The Iron Dome system intercepted eight missiles in the early morning barrage following a night of relative quiet, when approximately half a dozen rockets were fired on the western Negev. An initial warning of an incoming missile on Ein Gedi, at the Dead Sea, after was clarified as a mistake. 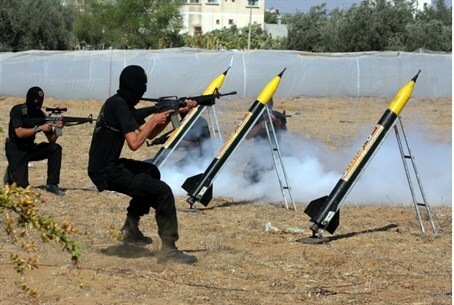 Tuesday’s barrage of missile and rocket attacks, which is continuing at this hour, came at the same time reports circulated in some Arab media sources that a ceasefire is imminent. Israel still is considering a ground incursion into Gaza, and the government will discuss on Tuesday the possibility of increasing the number of reserves to be called up for service. The government is facing intense pressure from the international community and foreign media to agree to a truce. Virtually all leaders agree that Hamas’ announced conditions of a ceasefire are unacceptable because the result of removing the maritime embargo would be to allow it to freely bring in weapons from the sea.